Secret in Their Eyes is revealed on Blu-ray, but sadly isn’t as explosive as one would hope. 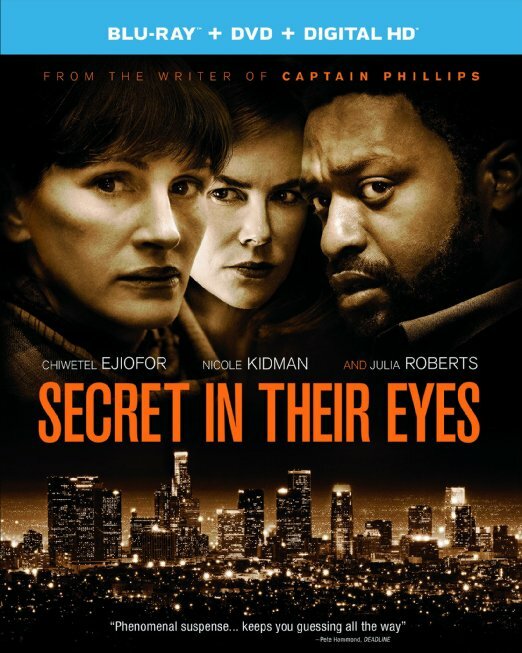 Secret in Their Eyes really should be a heck of a thriller. Written and directed by Billy Ray, the man who brought us the indelible Breach in 2007 and starring a high-line cast including Chiwetel Ejiofor and Julia Roberts, the movie has all the ingredients that should have led to an unforgettable mystery drama. But sadly, those ingredients have not added up to more than a fairly unimaginative replay of the 2009 Oscar winning Argentine film El Secreto de sus Ojos. Without getting into spoilers, the story involves a fifteen year old homicide case and how that case has impacted two Los Angeles investigators for the worse over time. Julia Roberts gives a strong performance as Jess Cobb, the investigator most specifically impacted by the case, but the script never gives her much beyond the obvious with which to work. Similarly, Chiwetel Ejiofor and Nicole Kidman do their best with limited material on their own ends, but they are unable to turn the leaden package into anything interesting. BIG SPOILERS: The basic problem here seems to be one where Billy Ray’s adaptation has almost completely missed the point of the original material. The original 2005 novel and the 2009 award-winning film El Secreto de sus Ojos covers a murder that occurred around the time of Argentina’s Dirty War in the 1970s. In the original story, investigators are trying to find the person who raped and murdered a woman, to provide justice to the woman’s husband and to solve the case in general. For multiple reasons, they are unable to bring the killer to justice, given that his violent talents are useful to the ruling party and given the dissension within their own group. Twenty-five years later, the primary investigator is still trying to bring the killer to justice, only to find out that the victim’s husband has taken matters into his own hands. There are two main threads that run through this story. The first is that the story is told from 25 years after the fact, with the narrative running back and forth between the present day and the past – allowing past and present to inform each other throughout. More crucially, the main clues to what is happening come from various people’s unguarded looks in their eyes – the telltale secret of the title. The investigators find their suspect by noting that in photos with the victim, he’s always looking at her. They pin him down because during questioning, his eyes give him away. And in the end, after the true nature of the husband’s revenge on the suspect has been revealed to the main character, his counterpart is able to figure out something’s up just by looking in his eyes. There’s a lot more to the original story than this, but these are the pieces that are necessary to understand what happened with the current film. MORE SPOILERS: To translate the Argentine story to the US, Billy Ray has transferred the location to Los Angeles. In the place of the Dirty War, he gives us a backdrop of the immediate aftermath of 9/11/2001. And in the place of the grieving husband, he substitutes Julia Roberts’ tough detective, whose daughter is now the victim. Like the original story, the new movie flits back and forth between the past and the present, now compressed to 14 years. And many of the original plot elements have been preserved, albeit in a slightly altered fashion. The daughter’s killer is initially spotted in photographs. And he’s able to escape justice due to various people within the police department’s differing objectives – including the fact that the killer is a potential source of information on possible new terrorist attacks. As a result, the investigators can’t help one of their own and they can’t prosecute a man they know to be guilty. Theoretically, that should all work – particularly given the strong cast and the director involved. SPOILERS CONTINUE: And yet the movie comes up short. Part of this is simply due to the movie repeatedly going for the most obvious moment rather than the most interesting one. The characters seem to always say whatever is on their mind without any thought of subtlety. Simple discussions between the detectives seem to always result in confrontations, even physical ones. The scenes in the unhappy present are simply loaded with what is intended to be the weight of years but winds up feeling like self-importance. In short, there’s very little depth to this pool. Julia Roberts’ character winds up coming across as morose rather than driven. And by the end of the movie, her actions are frankly inexplicable. With the original story, the idea of the husband’s revenge makes sense as this isn’t a character who is integral to the investigation and its consequences. With the Billy Ray version, Roberts’ Jess is right in the middle of the whole present day story, which means she’s fully aware that the other characters are looking for someone they will not be finding. More vexing still is that the new movie has lost track of one of the most important observations of the original story – the notion that people give themselves away with their eyes. With this movie, the characters don’t need to do that – they give themselves away with EVERYTHING. And the result in the end is that the audience doesn’t feel like they’ve seen anything that memorable – it’s just more cold, dark rooms with impassioned investigators emoting about the importance of this case, without any substance to give the matter any heft. It may be that this story just doesn’t translate well from Argentina to the US, or it may simply be that the filmmakers here settled for too low of a common denominator. Whichever reason it may be, the movie just doesn’t add up. Secret in Their Eyes was released to home theater viewers on February 23rd. The packaging includes Blu-ray and SD DVD editions of the movie, both containing the same materials. Instructions for downloading a digital copy of each movie are included on an insert in the packaging. Secret in Their Eyes is presented in a 2.40:1 1080p AVC transfer (avg 33 mbps) that does well in portraying the many dark interiors featured in this story. There’s not a lot of variety in the look throughout, even between the present-day scenes and the flashbacks, but the movie does sustain a convincingly bleak and cold environment. Secret in Their Eyes is presented in an English DTS-HD Master Audio 5.1 mix (avg 3.4 mbps, going up to 4.7 mbps in the big scenes). This is mostly a quiet movie, with the actors tending to speak in more subdued tones, but the volume does go up at crucial moments, particularly during a sequence set at Dodger Stadium. Secret in Their Eyes comes with a commentary and two extremely short featurettes as its only bonus features. The same materials are available on both the Blu-ray and the DVD editions. Both editions contain previews for other releases – the difference being that the Blu-ray uses online previews while the DVD has them on the actual disc. Feature Commentary with Director/Writer Billy Ray and Producer Mark Johnson (AVAILABLE BOTH ON BLU-RAY AND DVD) – Billy Ray and Mark Johnson talk the viewer through the movie with this fairly informative scene-specific commentary. Ray goes over as much of the production detail as he can fit in, including a discussion about how some elements like a passing train could be suggested with sound and light without needing to actually see them on camera. The guys also discuss what sounds like a fair amount of deleted scenes that are not on this disc, as well as what sounds like an extensive reshoot of the ending sequence. Adapting The Story for Today’s World (1:59, 1080p) (AVAILABLE BOTH ON BLU-RAY AND DVD) – This featurette, which is another one of our ridiculously short pieces, tries to quickly address how Billy Ray adapted the earlier Argentinean Oscar winner El Secreto de sus Ojos into the current production. Julia Roberts Discusses Her Most Challenging Role (3:23, 1080p) (AVAILABLE BOTH ON BLU-RAY AND DVD) – This is actually a much shorter featurette than it appears to be, as a chunk of the running time is taken up with actually including the scene discussed here. (SPOILERS HERE!) The scene in question is Jess Cobb’s discovery of her daughter in the dumpster, which actually entailed having the movie’s cameraman (and Julia Robert’s husband) Danny Moder climb into the dumpster with them. On-set footage played during this featurette is actually pulled from a later sequence in the movie, for some reason. DVD Edition – An SD DVD of the movie is included in the packaging, containing the movie in an anamorphic 2.40:1 transfer and Dolby Digital 5.1 sound (@448 kbps) and the same bonus features. Secret in Their Eyes is a horribly disappointing movie, particularly given the strength of the cast, the director and the base materials. Unfortunately, the strong plot from the original El Secreto de sus Ojos has not translated well to Los Angeles, and the result is a strident, over-the-top procedural that has very little depth. The Blu-ray has good picture and sound, and a fairly informative commentary from writer/director Billy Ray, but the movie itself never catches fire.